Ottawa shooting: Is this the ISIS backlash we've been waiting for? Is This the ISIS Backlash We’ve Been Waiting For? Flowers are left in memorial for Cpl. Nathan Cirillo of the Canadian Army Reserves on October 23, 2014 in Ottawa, Canada. 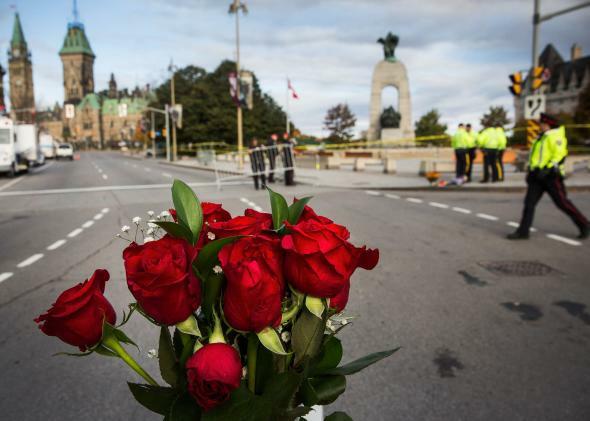 We’re quickly learning more about Michael Zehaf-Bibeau, the suspected killer of a soldier in Ottawa on Wednesday, who was himself shot dead after a rampage through the Canadian National War Memorial and Parliament. The attack came just two days after Martin Couture-Rouleau drove his car into two Canadian soldiers in a Quebec parking lot, killing one. According to the Royal Canadian Mounted Police, Rouleau was a recent convert to Islam and ISIS sympathizer who had his passport revoked for similar reasons. Prime Minister Stephen Harper has described the Ottawa shooting as an act of terrorism and called the Quebec incident “ISIL-inspired,” using an alternate acronym for ISIS. It’s not clear whether there was any direct connection between the Zehaf-Bibeau and Couture-Rouleau incidents. The Canadian parliament voted earlier this month to join in the U.S.-led airstrikes against ISIS in Iraq. ISIS has directly called for attacks on Canadian citizens, along with those of other countries participating in the coalition. Even if the attacks were ISIS-inspired, that probably doesn’t mean ISIS commanders in Syria or Iraq actually ordered them. ISIS has specifically called for “lone-wolf” attacks against Western countries, and it seems entirely possible that Zehaf-Bibeau and Couture-Rouleau , both reportedly active in jihadist web forums, could have hatched these not-particularly-sophisticated plots on their own. This certainly isn’t cause for comfort, though. Self-starting terrorists are a lot more difficult to track than those with direct ties to international networks. The incidents will also raise questions about the seriousness of Canada’s radicalization problem. A recent report from the the Canadian Security Intelligence Services, as described by CBC News, found “130 Canadians who had travelled abroad to join in alleged terrorist activities and 80 individuals ‘who have returned to Canada after travel abroad for a variety of suspected terrorism-related purposes.’” The Canadian government estimates that about 30 of the country’s citizens are believed to be fighting with extremist groups in Syria, including ISIS. According to the RCMP, Rouleau was one of 90 individuals with suspected radical ties under government monitoring. Again, we don’t yet know for sure whether Zehaf-Bibeau had any links to Syria or ISIS. A Politico Magazine article written last week, before either of these incidents, noted that U.S. politicians have been raising the alarm about terrorists entering the U.S. from Mexico despite little to no evidence of recent jihadist activity in that country. Meanwhile, politicians say little if anything about Canada, which does have such activity and has actually been the origin of attempted attacks on U.S. soil. Counterterrorism officials, though, do seem to pay attention to our northern neighbor: Canadian officials have complained for years about the “thickening” of the U.S.-Canadian border due to security concerns and I’d imagine it’s only going to get thicker now. While preventing attacks in Western countries was part of the justification for the international campaign against ISIS, it’s long been clear that the airstrikes would make such an attack more likely. Before the U.S., Canada, and their allies got involved, ISIS was mainly concerned with expanding its territory in Iraq and the Levant. Now, it’s behaving more like it’s erstwhile ally, al-Qaida. So far, ISIS-related violence outside the Middle East has been rare. Australia has seen two incidents. In September, an Afghan-Australian ISIS lieutenant in Syria called a friend in Sydney asking him to carry out a beheading on camera—the call was intercepted and the Australian friend arrested. Two days later, a “known terror suspect” who had been seen carrying an ISIS flag in public stabbed two counterterrorism officers in Melbourne before he was shot and killed. There was also Mehdi Nemmouche, the Frenchman who had spent time fighting with ISIS in Syria, who shot three people dead at the Jewish Museum in Brussels back in May, well before the airstrikes against the Islamic State began. Without minimizing the seriousness of these incidents or downplaying the tragedy of the lives lost, it’s fair to say that homegrown terrorists haven’t yet been able to mount the kind of catastrophic attacks we’ve feared. It remains to be seen whether this is all they are capable of, whether something much worse is in store.